Minneapolis and St. Paul are considering a number of streetcar lines. Three have risen to the forefront. The Central/Nicollet Line in Minneapolis, the Midtown Greenway in Minneapolis, and the Seventh Street Streetcar in St. Paul. In part this is viewed as an economic development tool. 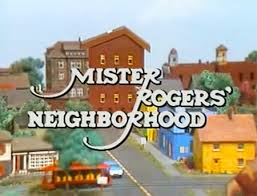 In part this nostalgia for an earlier simpler time, when we were all children, growing up in Pittsburgh. We at streets.mn have gone back and forth and back and forth on whether streetcars are a good idea. Obviously it is context dependent, and some ideas are better (less bad) than others. As with anything, resources are not infinite (I wish they were, but if wishes were horses we would all be riding around on horses). Thus there are trade-offs. The general trade-off is that streetcars are more expensive than buses, particularly in initial capital expenditures. Thus with a finite amount of resources you can do fewer streetcars or more buses. Those rail-based rides are slightly nicer (particularly smoother) (since with streetcars you are building some of your own infrastructure, while with buses you are literally free-riding on infrastructure built by someone else, in various stages of disrepair). Streetcars do have a number of other properties in the current world that makes them less advantageous in many situations. They are starting from a base of zero lines. Thus until they are as ubiquitous as the bus, you are more likely to be able to have single-seat ride on a bus than a streetcar if you want to go anywhere past where the initial streetcar lines go. In a world with a near ubiquitous streetcar network, building an extension is potentially a better decision than in a world with a near ubiquitous bus network. Thus while it may or may not have made sense to dismantle the streetcar system, if it didn’t doesn’t imply it makes sense to build one now. The contexts are different. Bus lines can also branch. 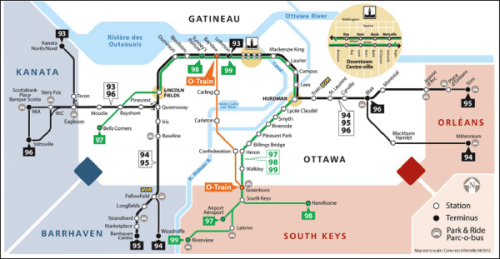 Sometimes a city is a tree (in contrast to the famous Christopher Alexander article), and branching systems coming together on an exclusive bus-way provide high frequency in high demand areas and lower frequency (but a single seat) in lower demand areas farther from the center, as illustrated by this schematic map of the Ottawa BRT. However if you are going to put a line in a place somewhere, you probably want to find a corridor where there is a lot of local short-distance demand so that transfers are not the main issue. Now I am dubious of the specific forecasting results (like why does Enhanced Bus have fewer corridor riders than No Build – Table 2, or why is the thumb on the scale for rail up to 25 minutes of In-Vehicle Time (p.2) when average journey-to-work time in the Twin Cities is less than 25 minutes, among others) that have been presented, and am in general skeptical of forecasts (having spent the first five years of my career building such models, hopefully less internally inconsistent), but nevertheless, even if the modeling doesn’t show it, this is obviously one of the best corridors in the region to make a transit investment of some kind. It is plausibly the main North-South spine of Minneapolis, certainly downtown and Northeast. So if you were going to build a streetcar, this would not be the worst place you could do it. In addition to the conventional home-to-work and shopping and restaurant markets, there is a large entertainment market (sports, theater, museums) and tourism market (conventioneers) which this serves. But we run into the general problem of streetcars (as opposed to LRT), shared right-of-way. Imagine instead we extended the car-free Nicollet Mall south of 12th Street down to Lake Street (yes, through the K-Mart). Local merchants and restauranteurs would undoubtedly scream for a while, since clearly many of their customers do arrive by automobile (hence the crowded parking lots). But there are many cross streets, and a number of alleys, which could be used to access parking (structured if necessary), while keeping Nicollet (Eat Street) clear of cars and better for transit (which would operate at somewhat higher effective speeds with less auto-interference, pedestrians, and bicyclists. 1st and Blaisdell would of course get more traffic. So this solution is not without consequences. Extending the car-free Nicollet Transit Mall deserves its own post. Even then, it runs into many at-grade crossings, which can be assisted with transit signal priority or preemption, but still creates conflicts. Given the grand visions we do have in this city, it is surprising that the (arguably) fifth densest downtown in the United States doesn’t have a subterranean transit line either existing or in the plans. In other cities, there are of course subways, which are not cheap, as well as bus tunnels, as in Seattle, which are also not cheap. But then you can go fast. Studies in the 1970s considered this option, and it was also considered for Washington Avenue at the University, and perhaps for one of the rejected alternatives of the SWLRT, but nothing I have seen recently even raises this option. Now I am not the type to say “Go Big or Go Home”, I am surprised no one else is saying it aside from a few forum posts at UrbanMSP. So while I am not advocating a subway, or a streetcar, this is among the least bad routes if you win the lottery and are somehow flush with cash. If there did not exist an almost fully grade separated corridor between the proposed Southwest LRT and the existing Hiawatha Corridors, planners would be dreaming of one. So given there is one, this isn’t really a question of if, but when. Something will be done here. For all the usual reasons, this should be a busway (with e.g. electric buses), but it will (for all the usual political reasons) of course be an LRT of some kind (perhaps using streetcar sized vehicles). There can be some interesting multi-modalconnections to the Hiawatha Line. There might also be opportunities to extend this to St. Paul. If Minneapolis gets it, St. Paul wants it. Seventh is St. Paul’s Main Street, so this is a plausible corridor to do something. The problem here is implied reading between the lines of Bill’s recent post, there isn’t enough demand in St. Paul. Somehow streetcars are supposed to solve that. For all the usual reasons this should be an arterial BRT (as the Metropolitan Council has proposed), but even more so, since the demand here is so much lower than the demand on the Central/Nicollet corridor. That is, Minneapolis has a line that connects to St. Paul (dubbed Green) and Bloomington (dubbed Bloo). While there is some dumbbell-like shape to the demand patterns (higher at the ends than the middle), they are asymmetric dumbbells, the Minneapolis weight is far greater than St. Paul or Bloomington. So though there is a certain triangular symmetry to completing a “Yellow” (Yellow+Blue=Green) rail connection between Bloomington and St. Paul, it’s demand will inevitably be lower than the other two so long as Minneapolis is larger than the other two cities in the Triplex. There is no guarantee that a Seventh Street line would connect to the Bloo Line. (To be fair, the Midtown Greenway might also be called Yellow, since it connects the Bloo and Green lines as well, maybe one can be the Turquoise route). [There is I recall a fantasy transit map to interline the 7th Street Streetcar with the Midtown Greenway, via Ayd Mill Road, thus enabling there to be a single Yellow Line, but it won’t do well for the Bloomington to St. Paul market]. 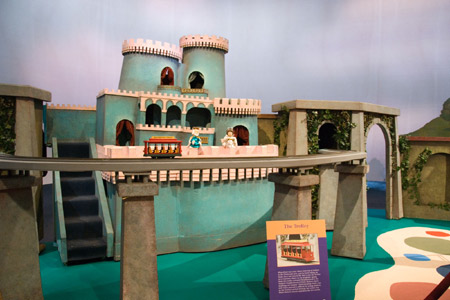 Just like Mr. Rogers’ neighborhood, the streetcar would go to a castle, in this case the Kingdom of Schmidt’s. 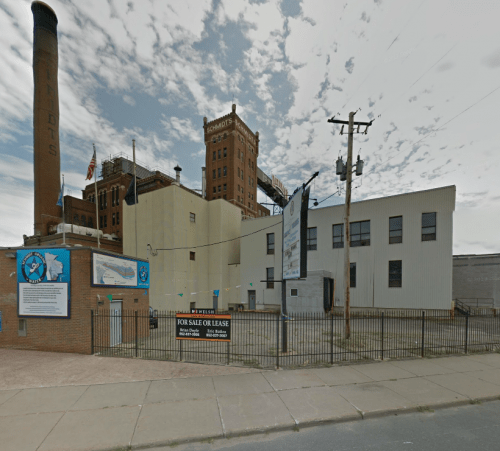 There are differences: Schmidt’s produced beer, the Castle in Land of Make-Believe intoxicated children with something else — visions of streetcars.